MGR’s bodyguard and who had acted as MGR stunt double in many movies K.P.Ramakrishnan, has been felicitated in Malaysia during MGR 96 function. The function was organized by Damodaran, President MGR Narpani Illam. The chief guest is Tan Sri Koh Tun Khoon (Minister in the Prime Minister Department). K.P.Ramakrishnan been felicitated by the Minister. Click the above images for further reading. K.P.Ramakrishnan and his service to our beloved Leader Puratchi Thalaivar MGR. We have already covered some of the information of this function through our Blog reader and my friend MGR Devotee Sree Sitharan. Below is the link. April month is ending as usual MGR movies are re-released frequently in Chennai and other cities of Tamil Nadu. In Chennai this week MGR’s Silver Jubilee movie Urimaikural is re-released in Mahalakshmi theater. The images and videos will be posted in our MGR Blog. MGR Devotee Tirupur Ravichandran has informed me that in Tirupur Kalaivani MGR’s 100th movie Olivilakku is released as 4 shows. And in Coimbatore Delite another MGR’s silver jubilee movie Enga Veetu Pillai is re-released as 3 shows. Udhayam Productions colour movie Pallandu Vazhga was re-released previous week in Mahalakshmi theater. We have already uploaded some of the images and video of the re-release. The story is a jail warden enacted by our beloved Leader Puratchi Thalaivar MGR, reforms 6 deadly prisoners (who had committed crime due to the situation) is released on parole and how our Leader turns the six deadly prisoners into persons of virtue by following his revolutionary techniques in reformation is the core of the story. MGR Devotee Sathya had captured some of the scenes from Pallandu Vazhga to share with MGR Blog. Below is the video clipping consists of two scenes. First is the intro of MGR and V.Gopalakrishnan in the Warden room, followed by MGR venturing with the 6 most dangerous prisoners he had choosen to reform and the punch dialogs. Other videos will follow soon. Below is the list of Directors who have worked with our beloved Leader Puratchi Thalaivar MGR in his 115 Hero movies. We have already covered the Directors such as P.Neelakantan, K.Shankar, T.R.Ramanna and M.A.Thirumugam who have directed more than 7 films. Click the below links for further reading of directors as individuals. P.Neelakantan directed 17 movies, M.A.Thirumugam directed 16 movies, K.Shankar who is also a great editor directed 8 movies, T.R.Ramanna who directed 8 movies also produced 8 movies. The movie names in bold letters are MGR’s double action movies. Of this P.Neelakantan has directed four movies. And he held's the distinction of directing MGR in more number of films (17) including four double action movies. Other directors who directed couple of MGR dual action movies are K.Shankar and MGR. Udhayam Productions, MGR starrer and Shantaram’s Do Aankhe Barah Hath Tamil version Pallandu Vazhga re-released in Mahalakshmi theater this week. The movie had a good opening and the Sunday show was almost full (Theater capacity 900+) Sunday was Tamil New Year and MGR devotees and fans it is a treat to watch MGR movie. The celebration was as usual. MGR Devotee Sathya had captured some images and videos of this celebration and as well as the response of people when MGR appeared on the silver screen. The above is the Newspaper ad given to Pallandu Vazhga during its first release. The re-release print of Pallandu Vazhga is very bad. We have watched movies of Guava colour, Eastman colour and Technique colour, the colour movies of MGR which are re-released now a days is called MGR colour. The full frame is pinkish. Below is the example of that MGR colour print. Video of MGR Fans celebration for the re-release in front of the theater and followed by the intro of our beloved Leader Puratchi Thalaivar MGR. More videos of Pallandu Vazhga will follow soon. MGR Fan from Malaysia Sree Sitharan has forwarded some images of MGR 96 function celebrated in Malaysia on 7th April 2013. The Invitation for the function. 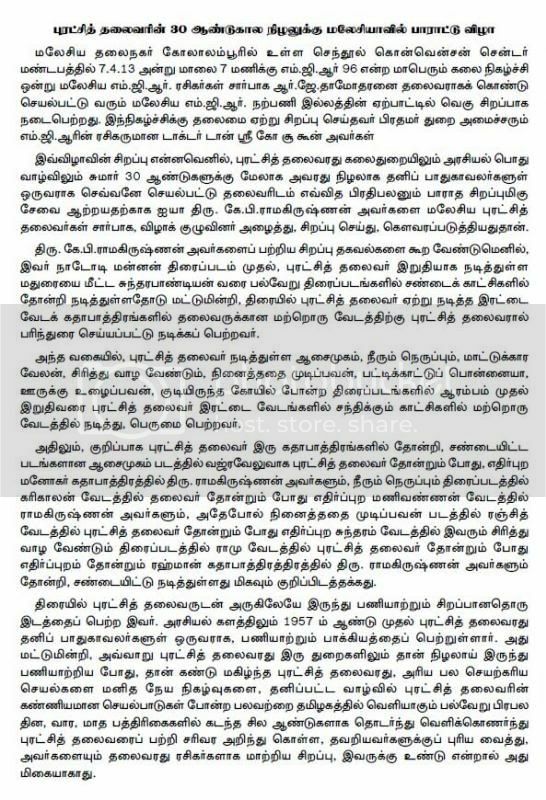 Sree Sitharan article about MGR 96 Function. Sree Sitharan with MGR’s Bodyguard Ramakrishnan. Malaysian Performers for the show, MGR Hari , MGR Laxmanan, Malaysian Sataya raj and local singers ! Mr Thamothran revealed that his hard work , distributing leaflets and kept existing Mgr fans' informed through text messages and phone calls ! As a result as many as 2,500 mgr lovers & visitors turned up for the one day event ! The show was super ! It gives me great joy to see K P Ramakrishnan for the first time , also 'Namakal Mgr ! I had warm hugs with this two VIP's ! Really a rewarding experience ! 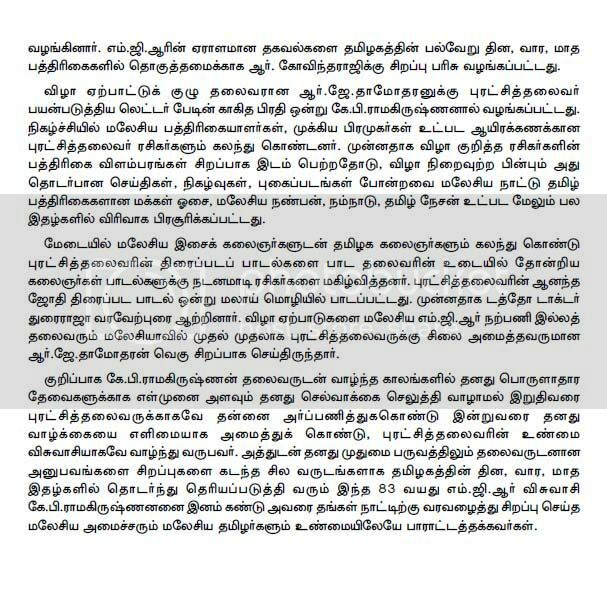 Mr K P Ramakrishnan's message about our Thalaivar MGR was well crafted and wonderful to hear ! Something I have not heard before ! One word , to say I was completely overjoyed and impressed to learn & hear more about our Thalaivar MGR ! Show ended at 11.30 pm. Namakal MGR performing for a MGR song in our Thalaivar style in the stage. The function was a great success. As per the invitation there were no Tickets for the show! It was a Free show! All the images and the credit goes to Sree Sitharan. MGR Black and White movie Oru Thai Makkal re-released this week in Mahalakshmi theater. MGR Devotee Sathya had forwarded some images and one video of this movie captured in Mahalakshmi theater. The movie had lot of cuts but the print was good. Much better when compared to Alibabavum Narpathu Thirudargalum, Raman Thediya Seethai, Netru Indru Nalai, Olivilakku etc. As usual MGR devotees had garlanded MGR’s cut out and many MGR fans association have placed their respective banners. This movie was under long time production. Video, only the title of Oru Thai Makkal movie. A postage of our beloved Leader Puratchi Thalaivar MGR has been issued earlier by the Government of India. Below is an article that appeared in The Hindu. The Department of Posts has so far issued seven commemorative postage stamps related to cinema. On April 30, 1971, the first of its kind was issued in memory of Dada Saheb Phalke (1870-1944) the Initiator of Cinematographic Art in India. The 20 paise stamp in plum colour depicts a portrait of D.Phalke on the background of a filmstrip with a line drawing of a film camera of early days. Commemorating the Sixth International Film Festival of India, a multicoloured Rs.2 stamp was brought out on January 3, 1977. The globe encircled with a filmstrip is shown on the stamp. Honouring Charlie Chaplin (1889-1977) a 25 paise stamp was issued on April 16, 1978. Marking the 7th year of Indian Cinema, another stamp was released on May 30, 1989. The 60 paise stamp in black and orange portrays a scene from the first Indian feature film “Raja Harishchandra”, produced and directed by Dada Saheb Phalke, and screened at the Coronation Cinema in Bombay on May 13, 1913. The film was 3,700 feet long. 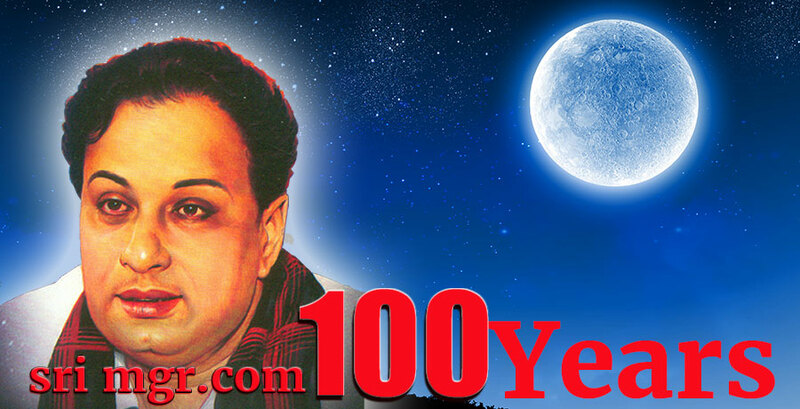 Honouring M.G.Ramachandran (1917-1987) a great Tamil actor and former Chief Minister of Tamil Nadu, a stamp was issued on January 17, 1990. The red-brown 60 paise stamp shows his portrait with his typical fur cap and dark glasses. In memory of Nargis Dutt, a one rupee stamp was issued on December 30, 1993. Apart from being a film artist, she founded the Society and School of Spastics in 1972. In sepia colour the stamp features a charming profile of Nargis together with the insignia of the Spastic society of India. The three letters (SSI) are so designed in the insignia as to show us a cramped victim of spasm. A unique and beautiful stamp was brought out a fitting tribute to Satyajit Ray on January 11, 1994. The multi coloured Rs.17 stamp depicts a portrait of Satyajit with the honorary “Oscar” film on one part (Rs.6 stamp) and a scene from his first film “Pather Panchali” on the other (Rs.11 stamp). This stamp is unique in using the Ray Roman type face for the first time on any Indian stamp, and also for the size 10.15 cm. by 3.15 cm. 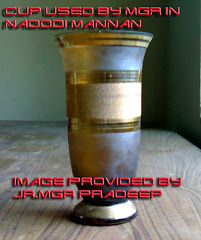 The article was written by P.Solomon Dhanaraj.